The U.S. Capitol Building has 365 stairs to its front doors – one for every day of the year. Normally, this climb takes only a few minutes, but for AFGE Council of Prison Locals (CPL) President Eric Young, the climb took three long years. This week, President Obama signed the Eric Williams Correctional Officer Protection Act, a new law to allow federal correctional officers and employees who work in medium and high security prisons to routinely carry pepper spray for self-defense. It also requires annual training of BOP correctional workers prior to the issuance of the new protective tool. The law first passed the Senate in December of 2015, then moving to the House for passage in February of 2016 and then to President Obama for signature in March of 2016. It took only three months to become law, but three full years beforehand to truly become a priority in Congress. 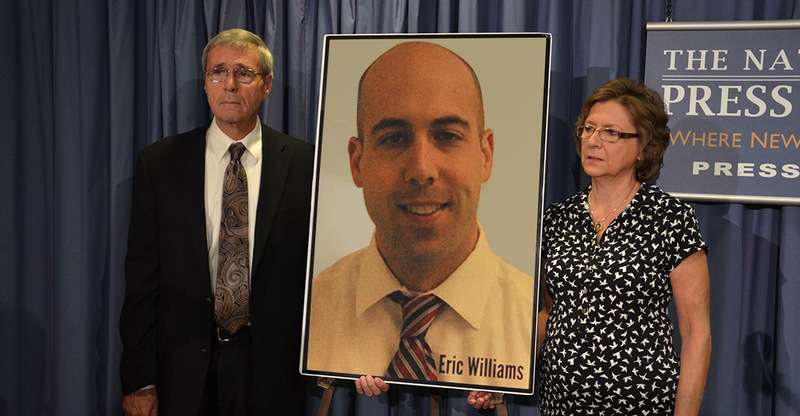 The Eric Williams Correctional Officer Protection Act began from tragedy in 2013. On February 25 of that year, a young correctional officer named Eric Williams was supervising 130 inmates alone at USP Canaan when he was stabbed to death by an inmate. That evening, Williams' parents Don and Jean received the phone call that no parent should ever receive. "It’s too difficult to describe what it feels like to get the call that your child was murdered," Don Williams said. "I’m not sure words can describe that feeling. What I can tell you is this: No family member should ever have to get that call." "I’m not sure words can describe that feeling. What I can tell you is this: No family member should ever have to get that call." Williams' death came just six years after the murder of another correctional officer, Jose Rivera, at USP Atwater in California, and just one day before the murder of a third correctional supervisor, Osvaldo Albarati, at MDC Guaynabo in Puerto Rico. All three of the officers' deaths were related to their work in federal prisons. As the families and union mourned for Eric, Jose, and Osvaldo, they knew that something had to be done to make prisons safer for correctional workers. In October of 2013, the Williams family and CPL called on the Obama administration and the Congress to increase staffing levels in overcrowded prisons, and to provide them a life-saving tool: pepper spray. That spring, the Bureau of Prisons expanded its pilot program to provide pepper spray to correctional workers in high security institutions – prisons like the one that Eric Williams worked in. And while the pilot program provided some officers with a valuable tool for self defense, it wasn't a perfect solution. Prisons were still overcrowded, with correctional workers supervising more than 100 inmates alone. Even more, the pilot program didn't cover every federal prison, and the program was only put in place temporarily. It was up to CPL activists to continue fighting. The union continued to build momentum to reform our federal prisons, attracting media from across the country at an October 2013 press conference at the National Press Club. The Council of Prison Locals invited Eric Williams' parents Don and Jean, Osvaldo Albarati's widow Helen Andujar, and Jose Rivera's mother and sister Terry and Teresa to demand safer workplaces. This drew national attention for the dangerous reality of working in the country's overcrowded correctional facilities. "Jose, Eric and Osvaldo did not know that they would not be returning home to their families the day that they showed up for work," Young said. "This is the same reality each of the brave men and women who work in prisons face around the country today." As support for safer prisons grew within the union, the activists found allies on Capitol Hill in Senators Pat Toomey and Bob Casey from Pennsylvania. Following a second vigil for fallen correctional officers in Memphis in May 2014, the two collaborated on a bill to provide permanent funding for pepper spray to correctional workers in medium and high security prisons, as well as to provide training for correctional workers on proper use. 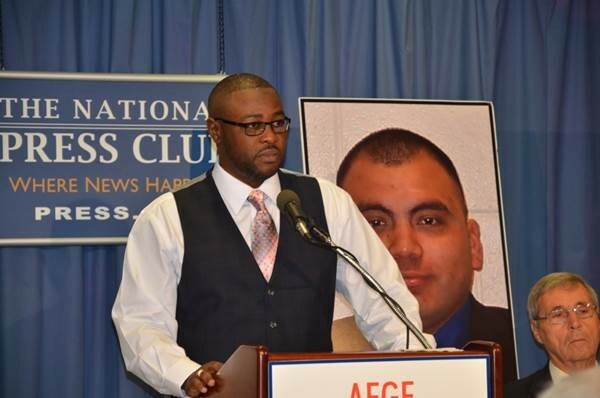 They called the bill the Eric Williams Correctional Officer Protection Act of 2014 in the Senate, in honor of the fallen correctional officer from their home state. "Officer Eric Williams' murder was horrific and shocking," Senator Toomey said. "It is clear to me that to prevent future tragedies and save lives, we need to expand the availability of pepper spray for correctional workers." Unfortunately, the bill didn't come up for a vote. But the momentum for reform couldn't be stopped. In November of 2014, the BOP expanded its pepper spray pilot program to include workers at administrative jails, medium, high, and maximum security prisons. The bill didn't die either. In January of 2015, the Eric Williams Correctional Officer Protection Act was introduced once again in the House and Senate. The fight for prison safety didn't begin and end with pepper spray. Through it all, AFGE continued to call for increased staffing in housing units, reforms to mandatory minimum sentencing to curb the exploding prison population, and more funding to hire new staff. So what changed? Congress started listening. The Bureau of Prisons received $133.5 million in additional funding in 2016, including $32 million specifically allocated to put another correctional officer in each high security housing unit so that workers were not forced to supervise inmates alone. The Department of Justice (DOJ) also made big moves in sentencing reform, after thousands of letters and phone calls from CPL activists poured into the halls of Congress in Washington. In 2015, the DOJ and US Sentencing Commission (USSC) reduced the mandatory minimum sentences imposed on some first-time, non-violent drug offenders, allowing judges a "safety valve" in their sentencing and helping to ease the overcrowding in federal prisons. The keystone achievement of the year, though, was the re-introduction and passage of the Eric Williams Correctional Officer Protection Act of 2015. Introduced in the Senate by Senators Toomey and Casey, the bill passed in December. In his speech at the bill's passage, Senator Toomey praised the Williams family for their advocacy, and praised the activists of AFGE CPL for their phone calls, letters, and lobbying visits to Washington to pass this bill. "Don and Jean Williams have been absolutely heroic advocates in insisting that corrections officers have this tool at their disposal," Senator Toomey said. Just 2 short months later, the Senate version was adopted by the House of Representatives, where it passed on February 24, 2016 – one day shy of the third anniversary of Eric Williams' death. Watch Congressman Tom Marino (R-PA) discuss the passage of the Eric Williams Correctional Officer Protection Act on the House of Representatives Floor. Young and AFGE President Cox all praised the passage as the final step in a 3 year battle, with Cox calling the passage as a huge victory for correctional worker safety. “We are grateful that this bill will provide our prison workers with the tools they need to protect themselves, before any more workers are seriously injured or killed in the line of duty,” Cox said. For the Williams family, the bill's passage was a promise that no more correctional workers would go unprotected like their son had. In their mist of despair, they formed a non-profit called the "Voices of J.O.E." Voices of J.O.E. is named after the fallen officers Jose, Osvaldo and Eric, whose families came together to stand up for safer prisons and common sense reforms in our nation’s correctional institutions. "After Eric was killed, I promised that I would do everything I could to help other officers come home safely to their families," Don Williams said. "No family member should ever have to get the call that their loved one has been murdered on the job. And with this bill now becoming a law, maybe no more families will have to." The Council of Prison Locals continues to work for safe prison reform, including steps to curb overcrowding, to provide correctional workers with safe gun lockers, and to ensure that no correctional workers are killed in the line of duty without consequences. For more information on these initiatives, visit Safe Prisons Project here.